Follow the footsteps of Benjamin Franklin and learn about American history on this guided, 75-minute walking tour in Philadelphia. Retrace Franklin's life and impact as one of America's founding fathers. Journey down cobblestone pathways, discovering important landmark locations throughout the Old City neighborhood — like the Liberty Bell, Independence Hall, and many more. 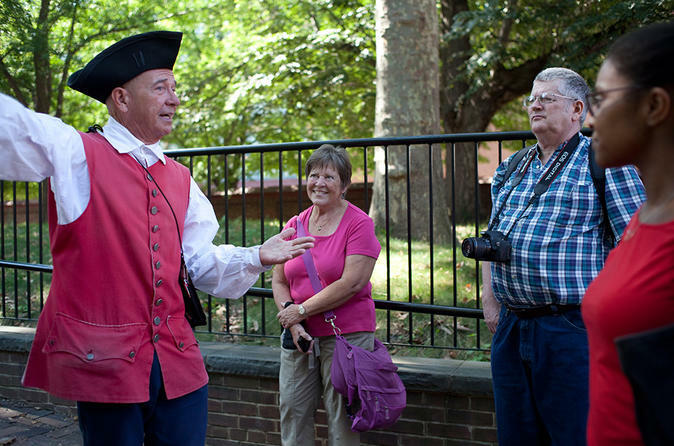 This 75-minute walking tour begins at the Independence Visitor Center, where participants begin to explore Philadelphia through Benjamin Franklin's eyes. As a historian guide leads the group around the historic district, learn interesting anecdotes and historical facts about each of the points of interest. Get an in-depth, personal look at Franklin's life and impact on American history. Along the way, see Christ Church, where Franklin and the founding fathers worshipped; the Christ Church Burial Ground, the final resting place of Ben Franklin and many historic leaders; and the Betsy Ross House, where the first flag was made. Learn about the National Constitution Center, the newest attraction to the historic area that explores the US Constitution, a worldwide symbol of freedom and justice. Other tour highlights include Independence Hall, the Liberty Bell, and Carpenter's Hall, where the Continental Congress met to discuss its grievances with England. After this enlightening tour, return to the original departure point at the Independence Visitor Center.